Sunset shots featuring kites always seem to come out well! Thanks. 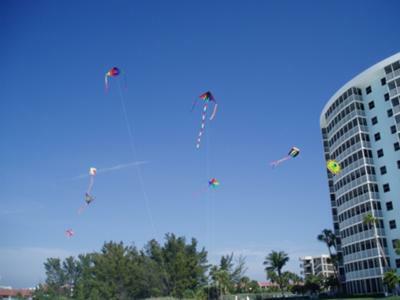 Siesta Key beach, south of Sarasota, Florida: I was trying to get as many flying kites up as possible. Got this pic when I had eight up, later got one more of the "daisy" cellulars up for a personal best of nine at one time! 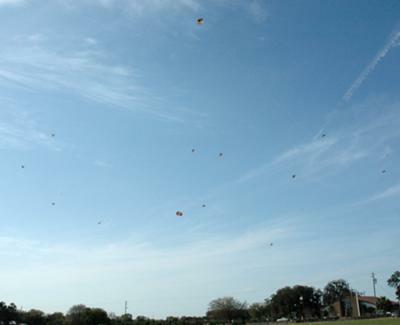 From lower left, the flying kites are: box, butterfly, parasail, Coyne, 6' delta, star, parasail and "daisy" cellular. Tied lines off to beach lounges, umbrella stakes, whatever I could find. 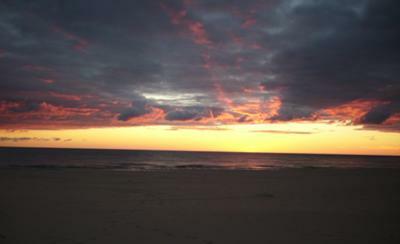 Got a lot of thanks for the "sky candy" from the beach denizens. Had everything up for at least 30 minutes; big job taking them all down again without bashing the tanning beauties. I have gotten 5 kites up in the air on Cape Canaveral beach, I am wanting to add more to the collection! Gotta love flyin! Joe, nice job, the pic looks great. You and another made a comment about anchors. I use the $1.00 cloth Wal-Mart bags. I put sand or rocks in them. They are very strong. Then I use a carabiner to connect the line to the bag handles. For hard tugging kites, more bags can be used. Keep'em flying Joe. One Man, Good job! I have done five but I cheated. (All Deltas) The problem for me is having enough anchors and kites. I only own 8 kites and have only been flying for 6 months now so we'll see. The challenge is ON! Keep it up OR Them up. Can anyone do 10? Nice composition Joe, with that eye-catching building on the right. All those kites must have a reasonable wind range for them to all stay up at one time. Such variety - I can imagine you giving other beach-goers a kite-type education on that day! Three 10 Foot Bees Chased by 36 Foot Clownfish. 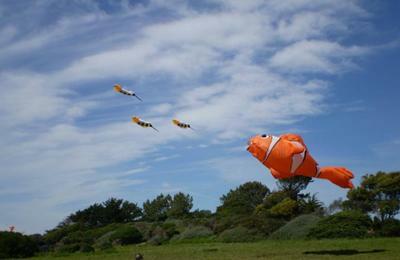 One day while I was flying my three 10 foot Bee kites in Berkeley, California when all of a sudden out of no were came this giant 36 foot Clownfish kite and started to chase the Bees. I thought that the fish was going to eat them! But I was wrong; it only wanted to play with them. And play they did all day long. We all had fun especially in Berkeley, California. Comments for Three 10 Foot Bees Chased by 36 Foot Clownfish. Thought I would get your April challenge going. This past Sunday the winds looked like they were blowing just right for flying a bunch of Rokkakus until I started to put them in the sky. At about kite number 4 the wind dropped. I figured it would come back so I just kept putting them out. Sure enough the wind came back up and I was able to get all the Rokakkus in the air for a photo. While I was setting up the kites people driving by the field kept slowing down, trying to figure out what I was up to. 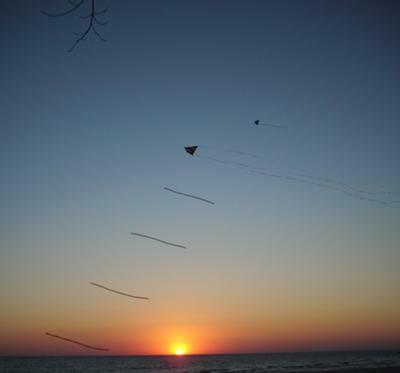 When I finally started to send the kites skyward I got waves and horns honked in approval. The whole thing took about three hours and twenty minutes. I had to hurry home, supper was waiting. The kites are all paper and bamboo Rokkakus about 45cm x 60cm and painted with images I found in books and on the Internet. Since they are small kites cotton line around 10-15 lbs was plenty strong and for anchors I used wood dowels run through a pencil sharpener. Once the line was let out I attached it to the dowel with a lark's head and then used a rubberband to hold it in place. I thought that 12 Rokkakus would do for now but when I started to put them away I realized that 13 had actually made it into the air. I know the Rokkakus are pretty small in the photo but they are little kites and the sky was rather large that day. 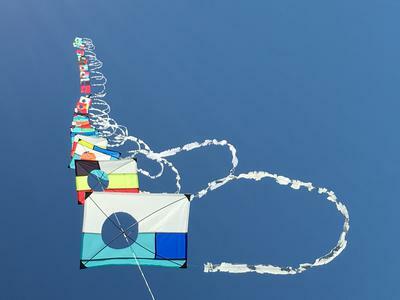 I have flown many more kites at one time but they were on a feather train line and I thought that trains would be cheating. Wow. A flying (!) start to the competition. Just hope everyone else hasn't given up :-) Oh, and yes everyone - NO TRAINS, STACKS OR ARCHES! Built in February, 2019 from scrap rip-stop. I'll bet this train gets some attention from onlookers! Good stuff. Again, feel free to add some more written info here.